WHAT IS THE STATE OF THE SOUND REPORT? As a national and tribal treasure, Puget Sound is worthy of our every effort for protection. Such effort requires the coordination and collaboration of hundreds of partners in planning, prioritizing, and undertaking the actions needed to recover and sustain Puget Sound. 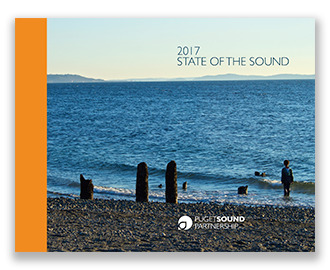 The biennial State of the Sound report is intended to help our partners and decision makers better understand how well the recovery effort is going. It also responds specifically to state statute (RCW 90.71.370(3)). WHAT’S INSIDE THE STATE OF THE SOUND? How is the ecosystem doing? What are the outstanding examples of recovery projects? How is management of recovery going? Who funds Puget Sound recovery? What is needed to see more progress in Puget Sound recovery? HOW IS THE RECOVERY EFFORT GOING? While always learning, we now better understand what needs to be done to ensure a thriving and sustainable Puget Sound ecosystem. And we see how to achieve our goals in ever smarter, and more efficient and effective ways. Meaningful and innovative work has been—and continues to be—accomplished. It is the daily hard work of our partners that moves the region toward a sustainable ecosystem. The Partnership supports these partners in planning, funding, and learning. The pressures on our ecosystem are great―an investment that is many times above past commitments, and from a larger portion of society, must be secured to safeguard what we treasure. Broader support for improved policies that protect and sustain Puget Sound is also needed. As it now stands, the 2020 goals will not be met. WHERE DO I FIND SUPPORTING DATA? HOW DO I REQUEST A PRESENTATION ABOUT THE STATE OF THE SOUND? Several of our board and council members have volunteered to deliver presentation about the State of the Sound to groups and organizations, as requested. For scheduling requests, please contact Cathy Cochrane, Communications Lead, at 360-790-7958.